We are so fortunate to have Alphagruis as a contributor to our forum (he's been on RPD for 11 years). He said something about corn salad. 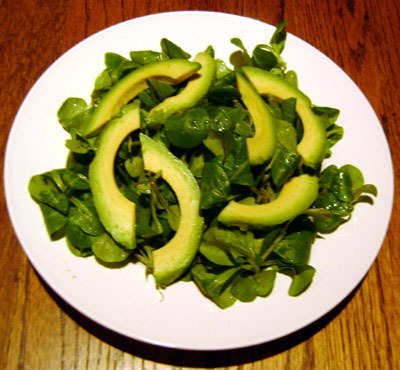 This link has pictures about how to prepare Lamb's Lettuce and avocado... seems it is marketed that these two go well together. Whisk together balsamic vinegar and olive oil to make a dressing (3 parts oil to 1 part vinegar). In a bowl, toss the mache lettuce with the dressing. Put the lettuce on a plate. Peel and pit the avocado. Thinly slice the avocado. Put the avocado slices on top of the lettuce. That sounds so vegan. How was it for you? I didn't have a lot of energy. Also, it kind of turned my teeth a little green, from the wild greens. Other than that, not too bad. I only did it for about 2-3 months. Haha C_kid, I admire your courageous self experimentations. Were you following the teachings of Dr. Robert Young "The pH Miracle" at the time? I also experimented on lots of avocado, nuts and raw green veggies before my high-fruit LFRV stint. I had terrible sweet cravings and would chew-spit bananas - I felt guilty for eating them...oh my, how screwed in the head I was at the time. I also had extreme fatigue at the time. Was an unpleasant experience. I never felt better than the one summer I was able to forage for most of my food - but I didn't eat just Lamb's Quarters (as they were called where I lived). I ate a variety of different wild greens. Avocados have been a staple food for me forever. Never seem to get tired of them although I have had to go without them for long periods because of unavailability. If I had lamb's quarters now I would be eating that salad all the time! I don't whisk the oil and vinegar - I just drizzle and toss and the avocados are easier to eat if cut into smaller hunks. But most of the time if I would come across lamb's quarters out in the wild it would be all gone by the time I got it home because imho lamb's quarters is one of the tastiest wild greens I've ever come across. I was just experimenting, I hadn't read that book you mentioned. I also went through the exact same extreme swing from high-fat raw vegan to very low-fat raw vegan. Thank you so very much for clearing that up for me Jessica! Lamb's quarters is indeed salty. I had some growing near salt water in a rich clay that was like a sacred experience once. Lamb's lettuce is supposed to grow here and yet I have not seen what I thought it was ONCE. Now I know why! Eating something in the valerian family (if it has any of the sleepy effects of valerian) during the day could be dangerous. I will have to research this more and find good pictures. The natives here ate a great a deal of lamb's lettuce I understand. I'd very much like to really know what it looks like. Tree-ripened avos fresh off the tree are pretty amazing. I had an couple of avos many years ago on a plane coming back from Mexico where I still treasure that memory! The ones I get are wonderful - but that was some sort of magic. If only I could have paired those avocados with that salty lamb's quarter I might have died from bliss. Oh - I love nasturtium! It's like adding pepper. You experimented with high-fat raw vegan yourself?! How did you manage to get that idea yourself? haha. I would never try a diet without seeing a "Dr." or "Licensed physician" endorse it. Now I know better..of course that qualifications don't mean anything. I was pretty in touch with the raw vegan community, I spent a lot of time on the rawfoods.com forums, and also lived in Southern California for several months on a raw vegan commune. I saw and heard about a lot of different raw vegan diets, so trying the high-fat one wasn't something i was afraid to do. I agree that open-minded people all end up at raw paleo, or something very close to it, if they experiment with diet long enough.